DRY, COOL AFTERNOON: With a good supply of sunshine, temperatures are generally in the 58- to 62-degree range across the northern half of Alabama this afternoon. The air is very dry, and tonight will be clear and cold again. 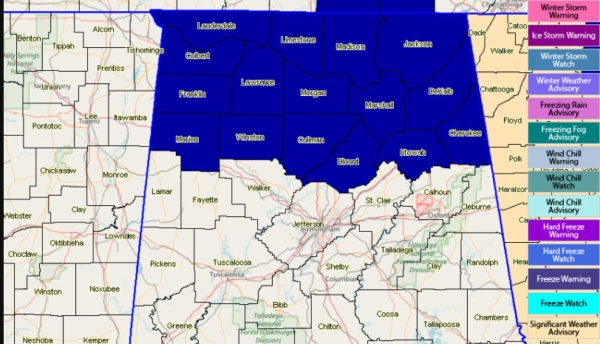 A freeze warning is in effect for a decent part of north Alabama again, for areas generally north of a line from Winfield to Oneonta to Gadsden to Weiss Lake. To the south, temperatures will drop into the mid 30s, and some scattered frost is possible down into the central counties of the state. WEDNESDAY/THURSDAY: Wednesday will be dry; the sky will be partly to mostly sunny with a high between 64 and 67. Clouds will increase Wednesday night, and a few sprinkles or patches of light rain are possible across the northwest part of Alabama. The air will be pretty dry, however, and rain amounts, if any, will be light and spotty. On Thursday, expect a partly sunny sky with a high in the low to mid 60s. Friday will be very pleasant. With ample sun the high will be well up into the 60s; some places could see 70-degree warmth. 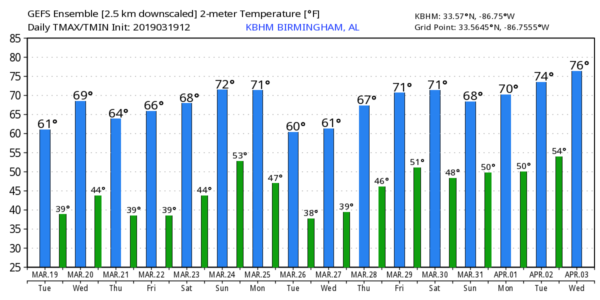 THE ALABAMA WEEKEND: Dry weather continues with mild afternoons and cool nights. Look for lots of sunshine Saturday with a high in the low 70s, and mid 70s are forecast Sunday with a partially sunny sky. Clouds will increase Sunday night. NEXT WEEK: A disturbance will bring periods of rain and possibly a thunderstorm to Alabama on Monday. Rain should end early Tuesday, and the rest of the week looks rain-free. THIS MORNING: The low this morning was 25 degrees at Rock Run, in Cherokee County, and Black Creek, in Etowah County.